Your Xbox One is cool, but if you don’t have an Xbox Live subscription, you’re missing out on all the multiplayer fun. Luckily, for a limited time Gizmodo readers can get a 12-month Xbox Live Gold subscription for just $44.99 - 25% off retail value. 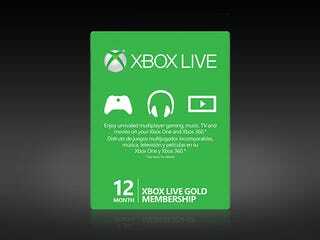 Most of today’s popular console games are made to be played online, so an Xbox Live subscription is essential for getting the full multiplayer experience. If that’s not reason enough to pull the trigger, the subscription also delivers an epic monthly collection of free games. Topped off with exclusive discounts (even up to 75% off), this membership pays for itself on day one. A year subscription is normally $60, but Kotaku readers can get one today for 25% off - just $44.99. Hit the link below to take advantage of this special offer.